When you reach adulthood, it’s widely known that one of the best financial decisions you can make is to build up your credit. By doing so, you’re allowed to rent an apartment, buy a car, or get a loan. Of course, it’s no secret that you should always strive to have a good credit score. In fact, there’s a multitude of websites and services all centered around allowing you to check your credit score for free, so that you’re always aware of your number. You’ve likely been warned about the dangers of having a poor credit score and the terrible consequences it can have on your finances. However, a poor credit score can have effects on your life and finances that you might not even be aware of. 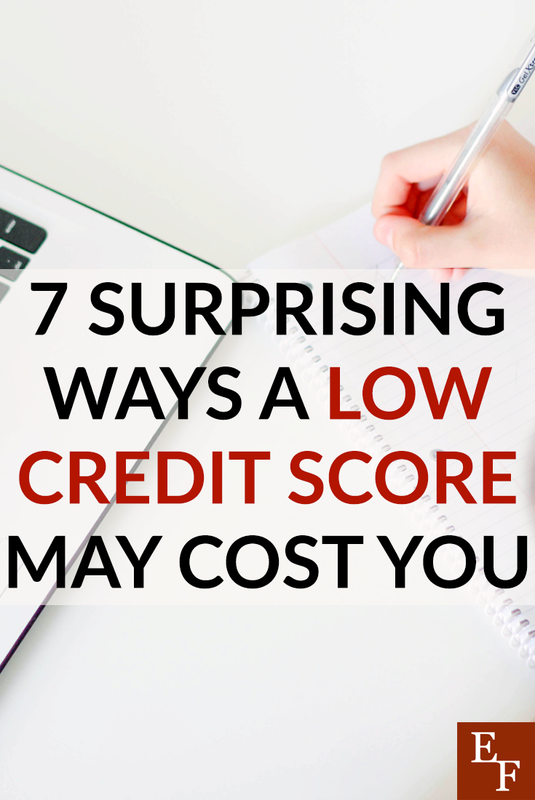 Here are seven surprising ways a low credit score can cost you. Chances are the day will come when you can’t afford to purchase something out-of-pocket, and you’ll need a loan. If you want to receive the best deal available, it’s imperative that you have a good credit history. Lenders and financial institutions decide on your loan and interest rate based upon your credit score. It lets them know how reliable you are. Ergo, the lower your credit score, the higher risk you pose for them. So, the higher interest rate you’re bound to get. The higher your interest rate is, the more you’re going to ultimately pay. Whether you’re trying to buy a home, car, or find insurance, a poor credit score is going to cost you more in the long run. This might be surprising, but nowadays, employers conduct a variety of background checks and screening processes before hiring an applicant. For them, it’s another way of ensuring that you’re a trustworthy and responsible candidate. In other words, it’s kind of like another reference. This is especially the case if your job requires that you have access to confidential information, large sums of money, or positions of government. Unfortunately, if you’re unsecured business line of credit score and history is less than stellar, it might cause an employer to call your character into question. In the end, it could cost you the job or career path of your dreams. When it comes to renting a home or apartment, people tend to be concerned most with location. Before you even sign a lease, however, many landlords and apartment managers require a credit check before giving you the green light. If you have a poor credit score, it can cause landlords to question whether or not you’ll be able to keep up with payments. At the end of the day, an apartment will always go to the renter with the better credit score. So, you’ll not only be out of an apartment, but possibly be forced to settle for a home you don’t really love. Life has a funny way of throwing obstacles unexpectedly our way. More often than not, said obstacles will cost you money. Even with an emergency fund, things like medical bills or major repairs to your home or car, tend to rack up an expensive bill that can sometimes cost you more than you have saved up. Unfortunately, a bad credit score means you might not have access to loan or have the required credit limit to pay off certain emergencies. It can ultimately leave you vulnerable and at a loss of what to do when tragedies in life arise. Not being financially secure is inevitably stressful. A low credit score usually means you’re stuck consistently paying off debt. You may be praying that your credit card doesn’t decline. You may even be unable to purchase the things you want. Having poor credit leaves you with few financial luxuries and can take the fun out life. If you’re unable to enjoy the things others around you do, you’ll no doubt be inherently more stressed out. Moreover, constantly worrying about your ability to afford the basic necessities of life, let alone the luxuries, makes everyday that much more stressful. Whether you’re forced to pay more because of higher down payments or interest rates, or have debts from old credit cards to deal with, a low credit score likely means that you have less money left over each month to spend. Any disposable income you have after paying all your bills and necessary expenses is probably going to be limited. Again, this means you can’t enjoy or afford to purchase items of enjoyment. You may also have to forgo hobbies or outings with friends that’ll cost you money. Less disposable income might leave you sitting at home on a Friday night. Like your landlord, many utility companies require a credit check before they’ll officially agree to provide you with their services. Again, they want to ensure that you can keep up with regular payments. They don’t want you to become a nuisance that they have to pester, or worse turn off service from. Although a poor credit score doesn’t necessarily mean that you won’t be given any service at all, it could mean that you have to pay a deposit before they’ll agree to setup your service. It’s easy to downplay the consequences of a bad credit score. This is especially true when you look around at our consumer-driven world. Most people have an array of credit cards in their wallets. Nonetheless, using your credit cards to the point of extreme debt or constantly being late on loan payments, not only lower your credit score, but can significantly impact other areas of your life as well. Remember, even with a credit card, make a point to only spend what you know you can pay back and pay on time. A bad credit score is hard to correct, and a good one will leave life a lot easier. How do you ensure that you keep a high credit score? Have you ever had to dig your way out of a low credit score? How Old Do You Need to Be to Start Building Credit? What’s the Best Credit Score to Buy a Car?